The Ratatouille-inspired wine never made it to store shelves. Remy, we were just getting to know thee. Remy the rat, the main character in the Disney/Pixar film Ratatouille (which has grossed approximately $180 million to date), will not be featured on a wine label, as was originally planned by Disney and retailer Costco. 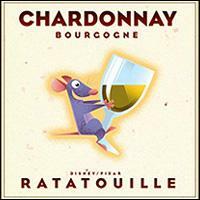 The company had purchased 500 cases of a 2004 white Burgundy that was to be called Ratatouille and sold at Costco stores beginning Aug. 1, but the plug was pulled after Disney was contacted by the Wine Institute, a group that represents California wineries. "We have a code for advertising standards that's been around since 1949," pointed out Wine Institute communications director Nancy Light. One of the key provisions, she said, is that member wineries do not put on their labels cartoon characters or other images that could be appealing to those under the legal drinking age. "We sent a letter to Disney executives," she said, which pointed out said violation of the code. "Together with Disney, we have decided to withdraw the product, prior to any bottles being available or sold, due to a number of groups with strong opposition to the wine," said Annette Alvarez-Peters, assistant general merchandise manager at Costco. Alvarez-Peters would not comment further on the situation, but Light said that despite Costco's not being a member of the Wine Institute—the group only represents California wineries—and that the wine in question was French, not from California, the organization still felt compelled to act. "Our main activity was to inform Disney," said Light, adding that the Wine Institute's reaction to the label would have been the same if it were from a member producer. "We want the industry to be understood as being socially responsible."